The Law of Compulsory Motor Vehicle Insurance covers motor vehicle compulsory liability insurance in a broad context by putting emphasis on the fundamental principles unique to this type of insurance, their operation together with the general principles of law, and the interventions of the relevant EU Directives and CJEU decisions. The law regarding motor vehicle liability insurance is ever-evolving, fast-developing and offering more intellectual challenges as the disputes vary every day. This book examines the principles applicable in this area of law by studying the grounds where the rules derive from and their continuing developments over decades at both domestic and EU levels. Whilst doing so it also discusses whether the sources of the current applicable law, in several different motor vehicle compulsory insurance related issues, are in line with each other. The book also presents careful analyses of the interplay between the different sources of law, detailed discussions on what the law should be in order to provide consistency amongst the rules and principles identified, and how solutions to newly emerging issues can be found. The regime applicable in this area is overcomplex. 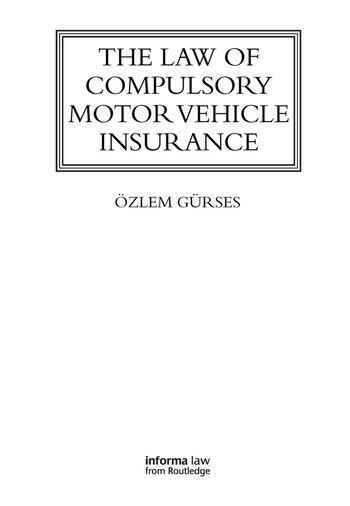 This book will be valuable reading for any lawyer, whether academic, practitioner or student who would like to understand the insurance cover required for compulsory motor vehicle third party liability insurance together with the rationale for adopting such rules and their interpretation by the Courts. Özlem Gürses is a Reader in Insurance and Commercial Law at King’s College London.